Product Description Great Outdoors. 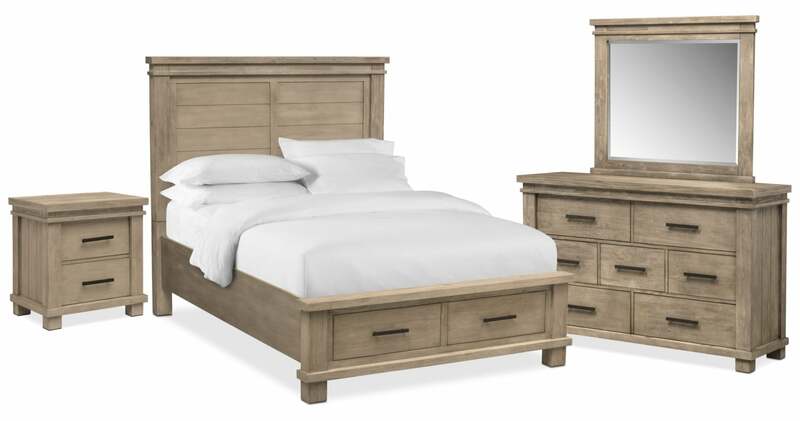 Incorporate your love of nature into your bedroom with the Tribeca bedroom set with storage. Featuring solid acacia wood construction, this rustic group pays homage to the gorgeous wood grains of the oldest trees, with each plank as unique as the design itself. Finding room for your clothing, bedding and other essentials is easy, with each drawer offering ample space. Additional drawers in the bed are the perfect spot to store fresh linens or sweaters. The real focal point of this set is the headboard; with an earthy wood paneled design, style comes naturally. Customer assembly required. Offset drawers add eye-catching element to the dresser. Tall, paneled headboard adds depth and natural beauty to your space with its vintage silhouette. Additional drawers at the foot of the bed are ideal for linens or other clothing.